The church is just an 8 minute walk from Wimbledon station. On leaving the station turn right and walk up Wimbledon Hill Road. After the second set of traffic lights (at Elys Department Store) take the first left into Mansel Road. 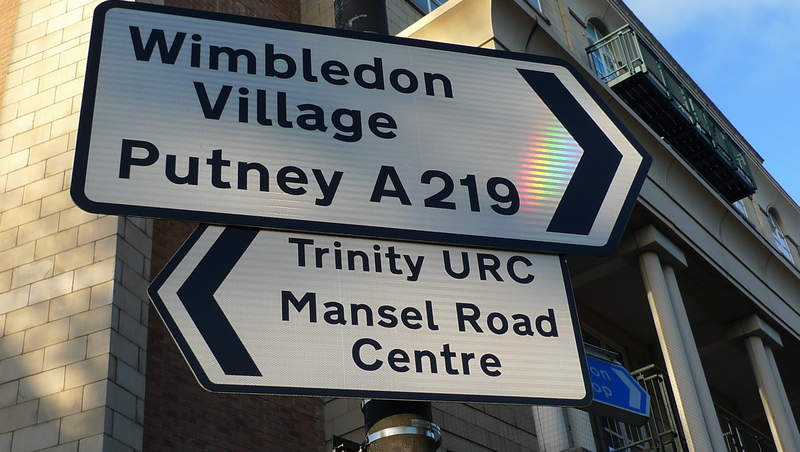 Trinity is about 100 yards down Mansel Road on the right-hand side and immediately next to Wimbledon High School. 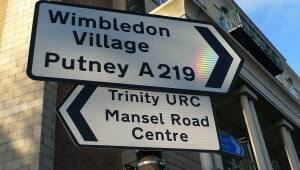 Mansel Road can be entered from Wimbledon Hill Road by turning left when going up the hill towards the Village. It is not permitted to enter turning right when coming down the hill. Mansel Road can also be entered from the other end by taking the Raymond Road exit at the mini-roundabout in Worple Road. In Raymond Road take the right turn into Mansel Road. Trinity is about 250 yards on the left. Street parking is available in Mansel Road and adjacent roads by meter payment until 6.30pm on weekdays and Saturdays but is free on Sundays. The nearest public car park is in St George’s Road (see map below). While Mansel Road is two way there is no exit at the Wimbledon Hill Road end.